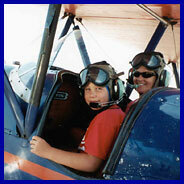 Kidznfun Article: Biplane Adventure - Fly over San Diego County - WOW! OK, I admit it. I was a bit nervous about this biplane adventure. I had never really been in a small plane before, let alone an open cockpit biplane, but I hid my uncertainty from my nine-year-old son, who also happened to be my partner on this adventure. We set out at noon for the small Carlsbad, CA airport. It's just a few minutes from Legoland and Carlsbad beaches. I put on a brave face, grasped my son's hand and signed our lives away on the liability release. Our pilot was friendly and informative. We had a five minute orientation (how the plane works, headgear for communication, foot pedals (don't touch), and a brief rundown of where we would be headed). My son got the giggles as he strapped on his retro leather helmet. We chatted through the headsets while the engine(s?) warmed up. Then bam, we were headed down the runway. The wind in our faces, the exhilaration of speed, and the open air beneath us, wow, the adventure had begun. My nerves calmed as we headed out low over the hills of Carlsbad. We got a bird's eye view (literally) of Legoland. My son remarked that the rides looked so small. Then we headed towards the Pacific, ablaze with the afternoon sun. Our pilot pointed out the edge of the red tide and the bands of waves supporting California's surfers. Tiny sailboats dotted the coast. I could do this all day! We banked and headed inland for a tour of the area's estate homes. We hit a bit of a fog bank and my stomach dropped. We got a little bumping and I grabbed my son's hand. I wondered if anyone had ever lost their lunch up here in the sky. Our pilot changed altitude and we were flying smooth again. Just like that. And then we were down on the ground. A picture perfect landing for this old bird (restored 1920's biplane) in more ways than one. My knees wobbled a little, but yeehaw - what an experience! I couldn't quite shake that flying free feeling. My son had little to say, but he grabbed my hand on the way back to the car. Sometimes that says it all. Barnstorming offers a variety of biplane adventures. I think 20 minutes is about enough for young kids, but those who want an even bigger adventure can opt for the U-fly-it option where you actually take control of the plane. Or the "Red Baron Thrill Ride" where you get "lots of sight-seeing plus plenty of yankin' and bankin'. Fly the La Jolla Coaster route plus thrill to wifferdills, lazy-eights, and chandelles." For real air thrill seekers, Barnstorming offers real air combat. You can take the controls, dive and climb in aerial dogfights (just like on TV). And new this year is the "Dapper Duffer" where you get an aerial view of some of the region's famous golf courses. You can "putt" to your heart's content. You can book flights online at Barnstorming.com. More on what to do in Carlsbad, plus where to stay, original articles and reviews, and more at Kidznfun here. More on the Carlsbad area at www.carlsbadca.org.